Leading community convenience store group SPAR has today announced that its fundraising efforts for terminal illness charity, Marie Curie, has passed the £1 million mark. SPAR stores began fundraising since the start of the partnership in March 2017 and have now reached this brilliant milestone which is the equivalent of paying for 50,000 hours of care from Marie Curie Nurses. Marie Curie provide care and support for people living with a terminal illness and their families, helping them make the most of the time they have together. In March 2017, SPAR stores supported Marie Curie’s biggest annual fundraiser, the Great Daffodil Appeal, hosting collection boxes and encouraging customers to donate. Since then, SPAR has continued its support of the Great Daffodil Appeal in 2018, as well as other annual fundraisers including the Blooming Great Tea Party. SPAR stores also fundraised through the sales of its sandwich ranges, including the popular Christmas sandwich selection, with a donation from each sale going to the charity. 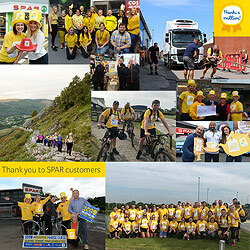 The local convenience store group’s efforts were matched by SPAR staff members organising fundraisers across the country, including cycle rides in Cornwall, Ben Nevis treks, ‘Go Yellow’ days and hosting hundreds of tea parties throughout the UK. Laura McNally, SPAR UK Marketing Controller, said: “We are thrilled to reach the £1 million milestone for Marie Curie. This was a nationwide effort, and we are truly grateful and thankful to everyone who helped make our efforts so fruitful. Having reached the £1 million milestone, SPAR stores will continue fundraising, with donations from the sales of fresh daffodil bunches and a selection of SPAR brand products will go towards this year’s Great Daffodil Appeal in March, while SPAR stores nationwide will be hosting Blooming Great Tea Parties in June. SPAR also aims to raise awareness of the charity’s Information & Support Line – 0800 090 2309 - through their digital channels and in-store communications.